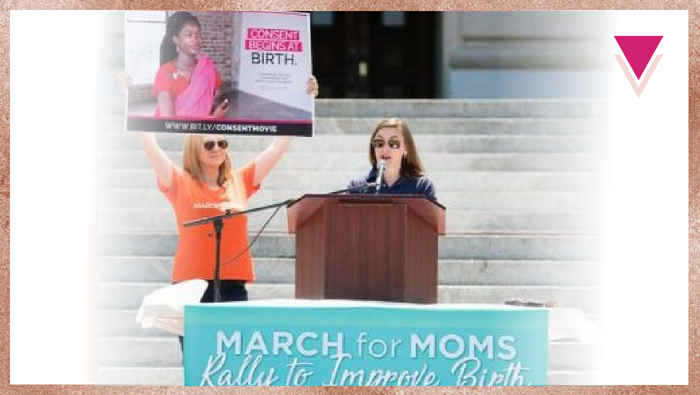 This was a speech I wrote from the heart in one sitting, the morning of the March for Moms rally on May 6, 2018. These words came out of a growing sense of frustration that American leadership is so quick to blame women for what are actually systemic problems in maternity care, while virtually ignoring their own part in mass human rights violations that cause trauma and poor outcomes. This was also in the middle of our Mother May I Kickstarter campaign, during which I was being inundated with stories of mistreatment and trauma. Someone said later I sounded “tense” and I think that’s true. Collaboration and positivity are good and necessary, but we must not lose our sense of urgency around what is truly a public health and human rights crisis. My name is Cristen Pascucci. I’m the former vice president of Improving Birth and the founder of Birth Monopoly. I live in Lexington with my dear, sweet, smart six-year-old son Henry–right over there. Since he’s been born, that child has put up with his mother listening to thousands of women tell me their birth stories; he’s accompanied me all around the country educating people about their legal rights in birth and advocating for more respect for birthing people in every way that I can think of. He’s put up with my secondary trauma for doing this work–and that’s because anyone involved in maternal health as an advocate is dealing with the trauma of witnessing and hearing and responding to the effects of a system that injures and traumatizes and lets die the people within it at rates that are *crisis level*. How do we fix these big problems? Maternal mortality is just the tip of the iceberg. The prevalence of perinatal mood disorders is a symptom. These are *not inevitable outcomes*. There’s a surprisingly simple big solution to this and it starts with rejecting the premise that the “experts in women’s health” are anyone other than women themselves. That the most important–the #1–stakeholder in maternal health disussions is anyone other than mothers. Telling women not to get pregnant–as was suggested at the most recent annual meeting of the American OB/GYN group to help prevent maternal mortality–is one more indicator that our approach is coming from the wrong direction. Not getting pregnant doesn’t fix the sexist and racist structure of our system. It means that when a black or brown or indigenous woman does get pregnant or decides to have a baby, she’s stuck in a system that doesn’t understand how to keep her and her baby alive and is largely unwilling to allow her access to care that is provided with love, compassion, and cultural understanding of what she needs to give birth safely. I don’t want to hear that this can’t be done. That we are too high-risk, too poor, too uneducated, too fat. There are people doing this work and they are already doing it better than American leadership thinks is possible. Look to Licensed Midwife Jennie Joseph in Florida, working with a high-risk population, saving lives just by basing her model of care on compassion. Look to Nicolle Gonzalez and the Changing Woman Initiative in New Mexico, centering her work in indigenous and Native American culture. These are just two examples of *leaders* who can do it–who are doing it–in their communities. We need to be looking to them and the other community leaders who center their work around treating women as whole people, hearts of their homes, and foundations for healthy families. We need to stop looking to the same system and “experts” who got us to where we are today. This isn’t just about more diagnoses, more treatment, more expensive technology. It’s about prevention. What if our system didn’t hurt and traumatize women in the first place? What if it gave women what they need and want? What if our system was re-centered around THAT and worked its way outwards? The research is clear on this: Women want and need communication. They want and need to be included in decision-making and to make decisions. They want and need to feel safe and cared for. They want and need evidence-based options–options that are safer, healthier, and less traumatic. Options like birth in birth centers, birth at home, birth with midwives, birth in hospitals where we are not held to outdated, sexist protocols about how we are “allowed” to give birth–how much time we’re “allowed”–what position we’re “allowed” to be in–whether or not we’re “allowed” to walk around or eat or drink. Whether or not we are allowed to say “NO!” when it comes to our own bodies, our own babies, our own births. If you hear nothing else I say today, I want you to hear this: It is time we stop characterizing what women say they want and need as wishes and desires and expectations to be managed and minimized. It is time we hear women’s wants and needs as MANDATES and recognize that they closely match what research and science tell us is best already: caring and communication to minimize trauma and its after-effects; birth in birth centers and at home and with midwives to allow for better health outcomes; mother-directed–not provider-directed–protocols. Birth on *our* terms and *our* timelines. And last, we need to make clear that we value mothers as human beings with human rights FIRST. It is a fundamental human right to determine the circumstances of how you give birth–where, how, and with whom. Right now, we have tremendous interference with this human right in the form of overly restrictive midwifery regulation, hospital policies, and hospitals and doctors defending themselves in courtrooms all over the country with the claim that they have the authority to override a woman’s decisions at their discretion. We have the majority of Kentucky hospitals “not allowing” women to birth a baby out of their own vaginas if they’ve had a previous Cesarean–and those same hospitals lobby in the state house to make sure those women don’t have the right at home, either. That’s true in Kentucky, in Alabama, in Maryland, and in many places all over the country. In closing: Women know what women need. And by God, we know what our babies need. It is a matter of fundamental human rights and it’s common sense. We are not vessels. We are human beings with brains, decision-making capacity, and fundamental human rights. We are the ONLY stakeholders who matter in maternal health discussions. Listen to us! Let us lead. Do not tell us we are “not allowed.” We will show you how it’s done.